As the A-League stagnates and football’s grass roots starve, there has been much heartburn about the shape of Australian football. 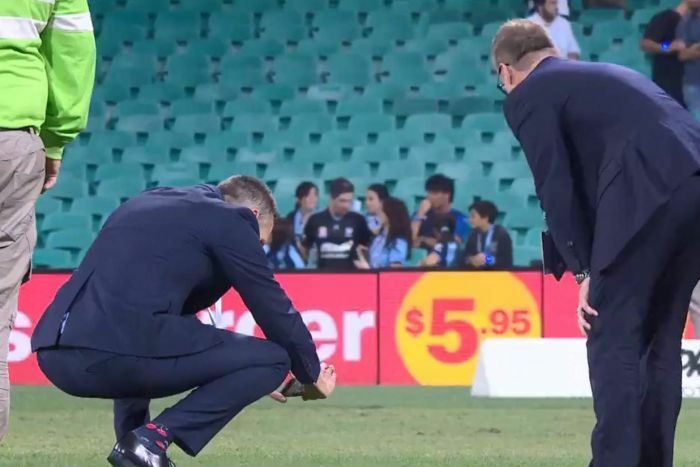 But the substandard condition of the SCG surface for Saturday night’s A-League game between Sydney FC and Melbourne Victory demonstrated yet again that the shape of the field on which the game is played can prove equally problematic. That Victory midfielder Terry Antonis suffered a knee injury after appearing to stumble on the edge of the centre square wicket merely highlighted what should have been an intolerable situation for any self-respecting top-flight football league. 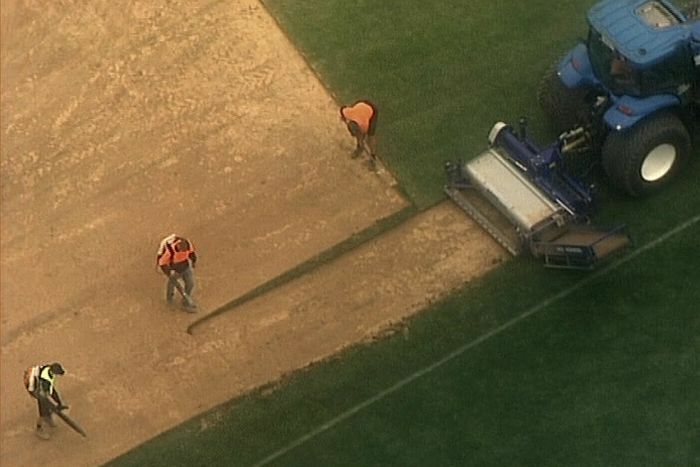 Yet again footballers were being forced to perform skills on a surface that has barely been suitable for the aerial pursuits of the AFL, NRL and Super Rugby; let alone the most literal form of football where a smooth surface is almost as vital to a good contest as the air in the ball. Predictably, volatile Victory coach Kevin Muscat was contemptuous of the “disgraceful” surface upon which the game was played. Ola Toivonen tweet: Tough result yesterday, Well done Sydney. Regarding the pitch the federation (FFA) need to take their responsibility. But Muscat’s most telling words were directed at those in the game who have failed to deliver better conditions, instead settling for fields pock-marked by the boots of co-tenants. “All the other codes treat us with contempt because we accept it ourselves,” said Muscat. Muscat’s anger echoed the frustration of all those football fans who have looked on week-after-week as Australian teams of all standards were forced to do their best on sub-standard hand-me-down surfaces. At the highest levels, right up to the Matildas and Socceroos, it happens because football has been defined by the shape of the field and squeezed into the all-purpose “rectangular code” category. Football, rugby league and rugby union play on a similar shaped field so investment in all-purpose stadiums seems wise. Yet, quite obviously, this does not take into account the disparity in the standard of the surface very different games require — or the fact that, unlike other countries where stadiums are shared, football is the poor cousin sleeping on the sofa, not the landlord. The SCG incident happened on an oval ground because the Sydney Football Stadium is about to be reduced to rubble and Parramatta Stadium is a fortnight from readiness for action. 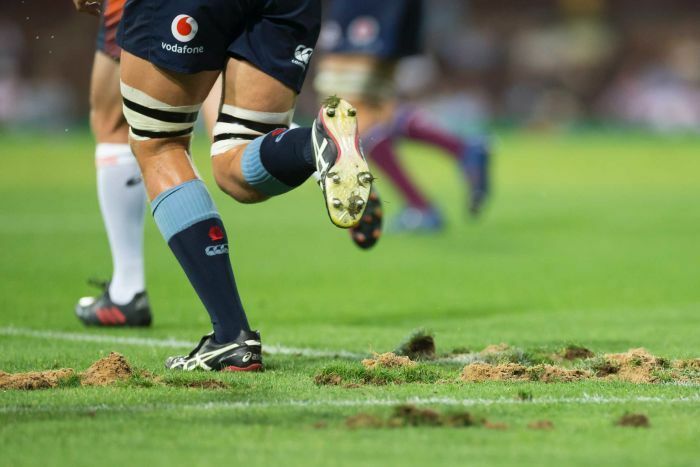 But even when these stadiums are complete there is no guarantee the surfaces they provide for football will be up to world class standard, particularly after they are subjected to the crunching hooves of rugby league and rugby union boots 24-hours before a match. Accordingly, football is a game crying out for more standalone venues so that it can control the conditions under which its biggest games are played, rather than playing third-string co-tenant. Those enormous participation rates are often used, with some justification, as a reason why governments at all levels should invest in purpose-built football stadiums. Wisely, Football Victoria is trying to get ahead of the curve with a facilities blueprint that includes building a home for the Matildas that would include a 5,000 capacity football-only stadium that could accommodate club games and possibly some smaller internationals. Yet as the NSW Government spends $2.2 billion on a shared rectangular stadium redevelopment, the dream of a Wembley-style home for Australian football remains farfetched. At least partly this is a result of Football Federation Australia’s lack of foresight and initiative in the period when the game had far more political bargaining power than now. Go back to 2006 when a Socceroos team replete with household names such as Kewell, Viduka and Schwarzer had reached the second round of the World Cup, the A-League was enjoying a bright start and the idea of that Australian Wembley did not seem unfeasible. Yet, notoriously, the FFA spent its political capital — largely gained through the network of former chairman Frank Lowy — on an over-ambitious and deeply flawed World Cup bid. Now, despite an overall increase in playing standard, the A-League is struggling for oxygen, the game is cash-strapped and unless a wealthy benefactor who fancies his name on a stadium sign comes forward, hopes of that much need football sanctuary seem forlorn. This should not be the case. As the AFL has shown with its voracious appetite for government funded venues, smart and strategic lobbying at council, state and federal level create enormous results. But since the promised 2022 World Cup photo opportunities disappeared amid a whiff of failure and corruption, football has had precious little to sell governments. Apart from the hope it could deliver the votes of grass roots participants — doubtful given many park players and parents feel disillusioned with a national administration that taxes them heavily to make up for shortfalls in top-level sponsorship and TV rights deals. Antonis’s injury is just the latest example of why football desperately needs its own ground for elite play at the very least. The ball bobbling over the foot of a Matilda’s defender should be enough. But until the game is run by those with a vision that includes a passionate appreciation of the game’s aesthetics, Aussie Wembley will remain a pipedream.